rocky's bru: Confidence, no confidence .. This no-confidence vote against the Prime Minister and the Government of the day is a game often played, maybe too often. Lim KIt Siang & Co has been playing it over and over again. In fact, back when Abdullah Ahmad Badawi's fall was imminent in the hands of repeat rebel king Tun Dr Mahathir Mohamad, Kit Siang even initiated a move to table a motion of Vote of Confidence for Pak Lah in Parliament! Yes, vote of confidence, just to spite Dr Mahathir and Umno! But bungle or not, the impact of their game is great. The Opposition know and everybody knows that the no-confidence vote is most unlikely to work. 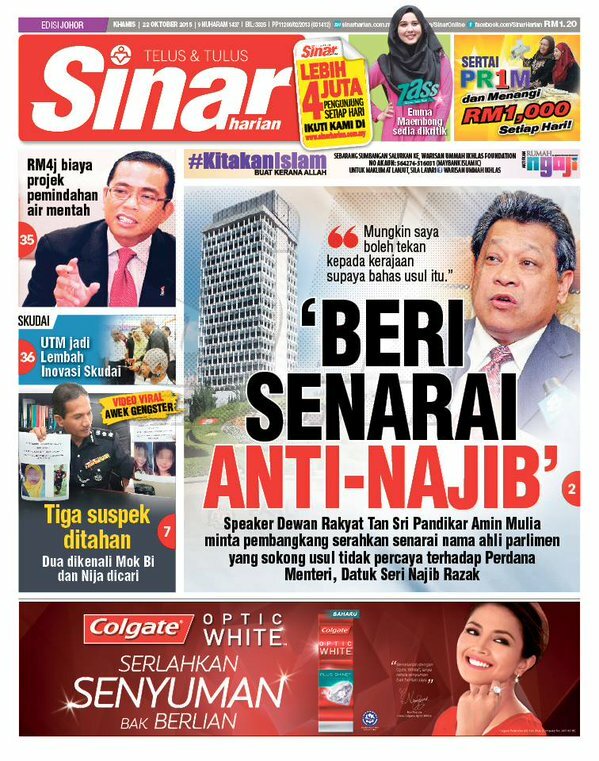 They don't have the numbers and, look, they can't (or won't) even come up with the simple Anti-Najib List that the Parliament Speaker Pandikar Amin had asked them to. As Kit Siang suggested in 2008, defeat a government bill or motion on a substantive issue for that will be tantamount to a no-confidence vote against Najib and the Governmnet. And what can be more substantive thatn the Budget 2016!? “Bersih 2.0 urges both Pakatan Harapan and PAS to instruct all of their parliamentarians to attend the Parliament during the budget debate and vote against the budget in every opportunity. “Bersih 2.0 also urges all Barisan Nasional backbenchers to cross the floor and vote down the budget. At the very least, all BN parliamentarians should abstain from voting in favour of the budget,” it said in a statement. I don't really care if they want to table a motion of no-confidence against Najib or a motion of confidence for Muhyiddin Yassin or anyone else they think should be their Prime Minister of Choice. But the intenion of blocking the Budget 2016 is malicious, even dangerous. It is tantamount to not just economic sabotage but it will seriously underine the well-being of the people these politicians are supposed to represent. PM Najib Razak tables Budget 2016 - one of the hardest budgets to table - tomorrow. “It is akin to a vote of no confidence. The only difference is that a vote of no confidence affects the Prime Minister while disapproval of the country’s budget affects the entire federal government. “In other words, it means that the present government has failed to command the trust of the majority and this will eventually lead to a snap poll." "In other words, it means that the present government has failed to command the trust of the majority and this will eventually lead to a snap poll." Your kiddies over at The Mole need to do their research. The Agong can reject any request to dissolve Parliament. It's in a little piece of paper called the Federal Constitution. Alas Latuk, you are failing in your sugar daddy duties. Rocky..I remember not too long ago you called him a great statesman..
kona sana kona sini. Resign jelah Najib. In fact you should be turning somersaults and cartwheels. for commenters to take potshots at you and your ilk. Break the champagne! Feel the earth move!